Let the experts at No Tie Bartending enhance your event with professional bartending services. Don’t hire your cousin’s friend’s sister to manage one of the most important aspects of your wedding. Use a professional. If the venue you’re using doesn’t provide bartenders, you’ll need someone. Our experienced staff are used to transforming fold-up tables into bars and mixing cocktails all night. Do you have a fashion show, corporate party or charity fundraiser? Have you rented a community hall, art gallery or other venue? Chances are you need a bartender for your event. One of our professionally trained experts will enhance your event threefold. Are you looking for a team of pretty ladies to help promote your latest beverage? Our promotions team at No Tie Bartending has experience working with both big and small brands and will ensure your product is represented in the most desirable way. All bartenders and serving staff have acquired and maintain their ProServe Certification. That certification means we adhere to responsible liquor service guidelines, ensuring the safety of your guests. Why Choose No Tie Bartending? This company was created to help provide wedding couples and party planners with reliable, professional and FUN bartenders that will enhance the atmosphere of any event. We provide bartenders for weddings, corporate events, private parties and public events. With over 22 years of combined experience between the founders, our knowledge of what we feel is acceptable standards for your event is what separates us from the traditional options available. We are "the anti-caterers bartenders" and we live and breathe this mantra. 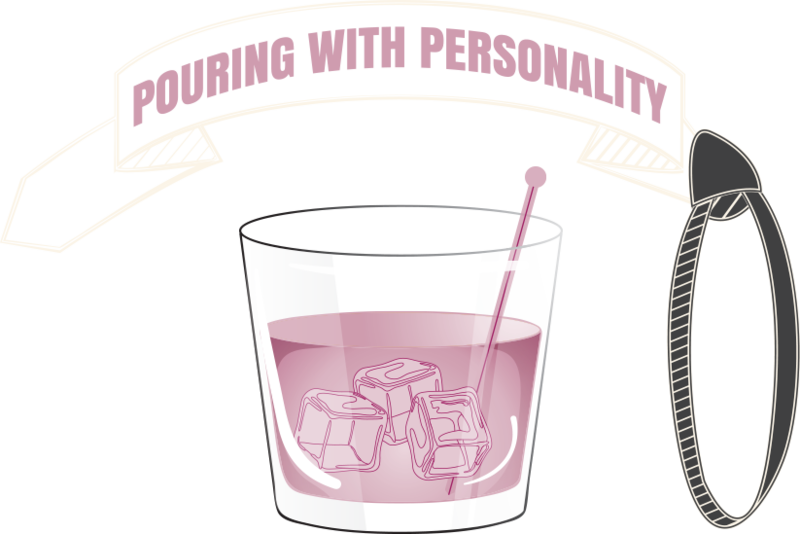 We pride ourselves on adding personality to your liquor service. Along with the personality, our professionalism pairs nicely with the knowledge of the service industry. We have been Bar Managers, General Managers, Owners, and most importantly Brides and Grooms here in Calgary. We have been in your shoes - deciding who should bartend your event can be stressful, we want to make it easy for you. We pride ourselves in providing immaculate service at your venue. When you hire No Tie Bartending for your Calgary Wedding, Corporate Event or Party, you can rest assured that you are hiring true professionals that not only know how to make drinks, but know how to make sure your guests are having fun. We’re only satisfied when you’re ecstatic. No Tie Bartending was founded by Tara Oates and Kevin Wilhelm in 2011. Having worked alongside each other for years, they each bring a different flavor to the business. Having extensive networks in Calgary with some of the city’s best bartenders, you can be assured of the quality of staff that you’ll be receiving for your event. All of the bartenders at No Tie Bartending also work in the industry – at pubs, clubs and bars. They know how to make current cocktails, are quick to pour, and have the personality to enhance your event. Need help serving drinks to guests? We’ve got you covered. Our serving staff has experience with cash n’ carry, running tabs or an open bar. Our girls dress nice, act professionally and bring a great attitude with them. We charge per event, unless your event is under 4 hours. Is your event out of the city? No problem – we can accommodate that for an additional low mileage fee. Inquire for availability and our rates by calling us or filling out a form. We don’t sell a product, we provide a service. We know the importance of your event – whether it’s your wedding or a fundraiser. By hiring us, we promise to provide the most professional service available at a reasonable and fair rate. We built our business on customer service and do everything we can to enhance your event. We have bartended in fields, community halls, art galleries, living rooms and everything in between. We have walked into many unusual scenarios where we ed to build a bar and work in unique settings. That’s what we love! Trust that we know how to make the best out of any situation and that we’ll do what we can to ensure your event goes off without a hitch (unless you are getting married, and in that case, we’ll make sure it goes off with a “hitch”). Have an event outside of Calgary? We frequently travel outside city limits to work events. Whether it’s on a ranch, in a different town or perhaps even across the province, call us to see if we have availability and what the travel charge would be. Want to make your event memorable with a unique cocktail that your guests haven't had before?Leave that to us. We'll design a special drink just for you! Complete the form below for a quote. Please allow a few days for a return.